Found 2 file extension associations related to Audio Comparer and 2 file formats developed specifically for use with Audio Comparer. With the Audio Comparer you'll soon be organizing your digital audio collection faster than you ever dreamt possible. 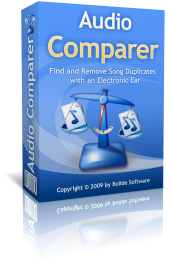 Using unique recognition technology, Audio Comparer doesn’t just scan your files; it actually "listens" to them and is capable of comparing different audio files note for note. You will never experience the hassle of duplicate files again! If you need more information please contact the developers of Audio Comparer (Bolide Software), or check out their product website.